Then – Circa 1900 (#A1326) photo of the Grace Methodist Church located on SW corner of South Main and West Market Streets, Urbana, Ohio. The Urbana Public Library on W. Market Street is visible on the right side of the photo. The church building was dedicated on June 22, 1879, by Bishop Bowman of St. Louis. The bishop said he had dedicated 800 churches and that this was the first one to be free of debt: nor had any other equaled it in beauty, neatness, and convenience for worship. In 1854 it was decided to organize a second church in Urbana as the Methodist Church at the corner of N. Main and Church Streets had grown to a membership of 432 which was regarded as being the limit in size for any one church. Grace Methodist Church served as the Second Methodist Church in Urbana. 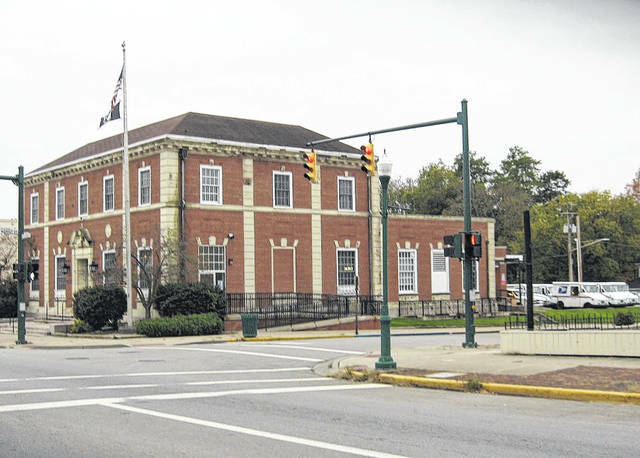 It was razed in 1931 and U. S. Post Office was erected on the site in 1932. History of the Urbana Methodist Church from 1804 to 1981, by The History Committee, Carl R. Robinson, Minister, Marvin Humphrey, Margaret Beatty Brandeberry, and Frances Bancroft, Church Historian. Now – 2017 photo of Urbana Post Office on the same site. The church was razed in 1931 and the Post Office was erected in 1932. — — — — The Champaign County Historical Society is an all-volunteer, not-for-profit organization that preserves, protects, archives and displays the artifacts that tell Champaign County’s History. The Society operates on donations and dues and has a free public museum of history at East Lawn Avenue in Urbana. Now – 2017 photo of Urbana Post Office on the same site. The church was razed in 1931 and the Post Office was erected in 1932.
https://www.urbanacitizen.com/wp-content/uploads/sites/36/2018/04/web1_Then-Grace-Methodist-Church201848131038612.jpgThen – Circa 1900 (#A1326) photo of the Grace Methodist Church located on SW corner of South Main and West Market Streets, Urbana, Ohio. The Urbana Public Library on W. Market Street is visible on the right side of the photo. The church building was dedicated on June 22, 1879, by Bishop Bowman of St. Louis. The bishop said he had dedicated 800 churches and that this was the first one to be free of debt: nor had any other equaled it in beauty, neatness, and convenience for worship. In 1854 it was decided to organize a second church in Urbana as the Methodist Church at the corner of N. Main and Church Streets had grown to a membership of 432 which was regarded as being the limit in size for any one church. Grace Methodist Church served as the Second Methodist Church in Urbana. It was razed in 1931 and U. S. Post Office was erected on the site in 1932. History of the Urbana Methodist Church from 1804 to 1981, by The History Committee, Carl R. Robinson, Minister, Marvin Humphrey, Margaret Beatty Brandeberry, and Frances Bancroft, Church Historian. https://www.urbanacitizen.com/wp-content/uploads/sites/36/2018/04/web1_Then-Grace-Methodist-ChurchWEB201848131043286.jpgThen – Circa 1900 (#A1326) photo of the Grace Methodist Church located on SW corner of South Main and West Market Streets, Urbana, Ohio. The Urbana Public Library on W. Market Street is visible on the right side of the photo. The church building was dedicated on June 22, 1879, by Bishop Bowman of St. Louis. The bishop said he had dedicated 800 churches and that this was the first one to be free of debt: nor had any other equaled it in beauty, neatness, and convenience for worship. 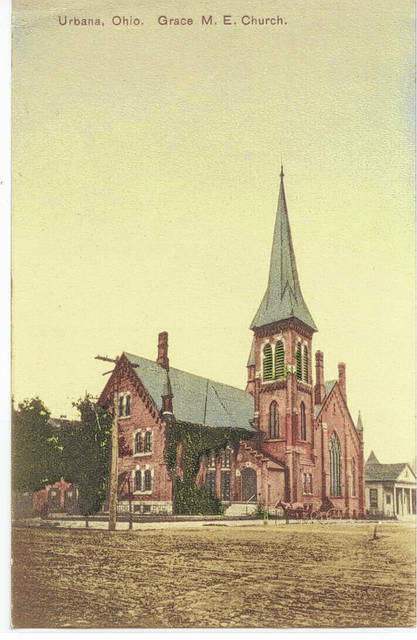 In 1854 it was decided to organize a second church in Urbana as the Methodist Church at the corner of N. Main and Church Streets had grown to a membership of 432 which was regarded as being the limit in size for any one church. Grace Methodist Church served as the Second Methodist Church in Urbana. It was razed in 1931 and U. S. Post Office was erected on the site in 1932. History of the Urbana Methodist Church from 1804 to 1981, by The History Committee, Carl R. Robinson, Minister, Marvin Humphrey, Margaret Beatty Brandeberry, and Frances Bancroft, Church Historian. https://www.urbanacitizen.com/wp-content/uploads/sites/36/2018/04/web1_Now-Grace-Methodist-ChurchWEB201848131044242.jpgNow – 2017 photo of Urbana Post Office on the same site. The church was razed in 1931 and the Post Office was erected in 1932. — — — — The Champaign County Historical Society is an all-volunteer, not-for-profit organization that preserves, protects, archives and displays the artifacts that tell Champaign County’s History. The Society operates on donations and dues and has a free public museum of history at East Lawn Avenue in Urbana. https://www.urbanacitizen.com/wp-content/uploads/sites/36/2018/04/web1_Now-Grace-Methodist-Church201848131045806.jpgNow – 2017 photo of Urbana Post Office on the same site. The church was razed in 1931 and the Post Office was erected in 1932. — — — — The Champaign County Historical Society is an all-volunteer, not-for-profit organization that preserves, protects, archives and displays the artifacts that tell Champaign County’s History. The Society operates on donations and dues and has a free public museum of history at East Lawn Avenue in Urbana.